Yesterday I had the pleasure of photographing (and eating!) 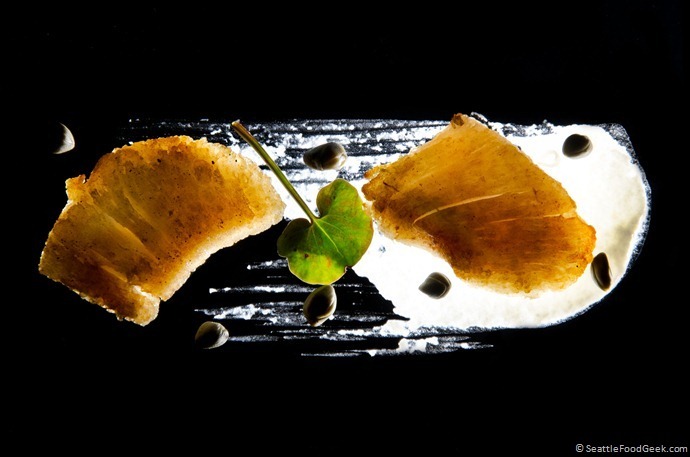 the Winter Tasting Menu at Canlis with Brian Canlis. 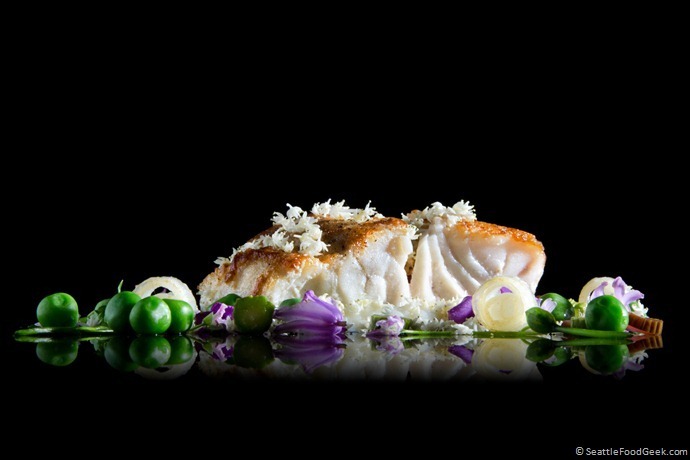 Again, Chef Jason Franey the team at Canlis are absolutely killing it. Here’s a look at what they’ve been up to, but the pictures don’t begin to do justice to the experience of dining at Canlis. I can’t stress this enough: if you haven’t been, go. If you haven’t been recently, you’re in for a whole new experience. Big thanks to Brian and the entire Canlis crew. I’m very happy to announce my first food photography print available for purchase. 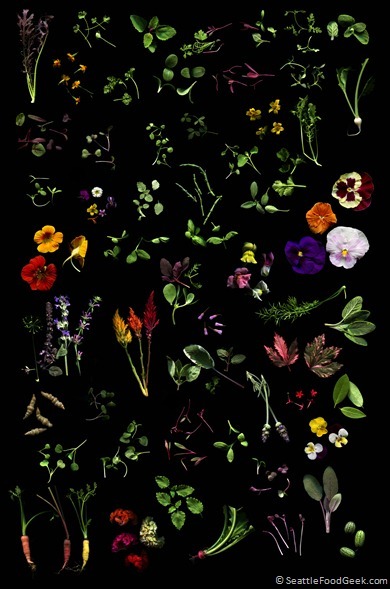 This image is an arrangement of 61 different microgreens, micro vegetables, edible flowers, herbs and mixes. 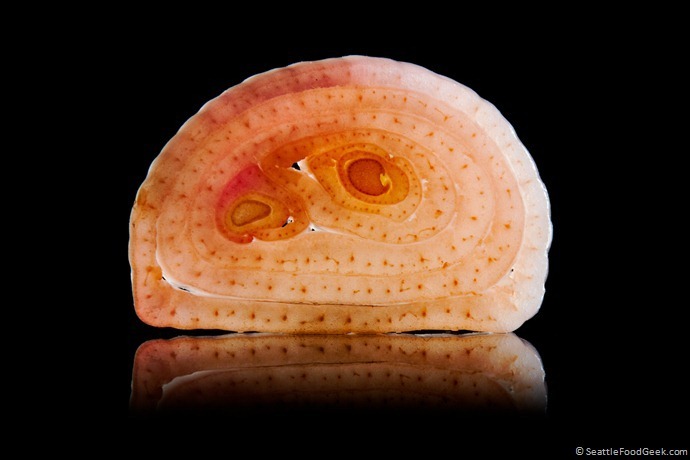 The original image is over 60 megapixels – I went to great lengths to capture all of the ingredients in high resolution. 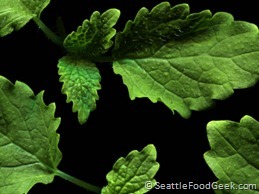 The shot below shows a zoomed-in view of mint apple leaves, found in the bottom center of the poster. If you’re interested in purchasing a print of this image, I’ve made it available for custom printing through Zazzle. If you’re interested in licensing the entire collage, or each of the ingredients separately, please contact me at scott@seattlefoodgeek.com. My friend and soon-to-be culinary school grad, Eric Rivera, invited me over last weekend to check out a few dishes he was working on. I decided to bring my camera gear to try to capture a few shots that he can use for his portfolio in the future. What emerged were some exquisitely beautiful platings and, if I may say so, the best food photos I’ve taken to date. The shot above is Eric’s version of a potato salad. 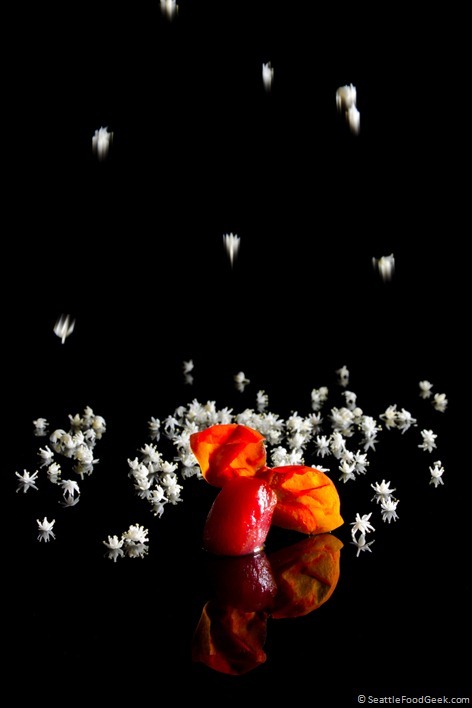 The flowers and greens came from his garden and his local foraging journeys. 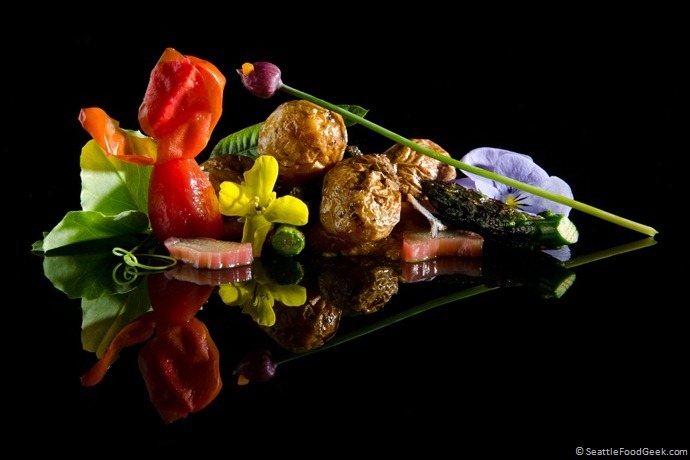 Click through for some pretty stunning dishes from this rock star chef. Halibut cheeks with cauliflower puree, capers and sorrel. 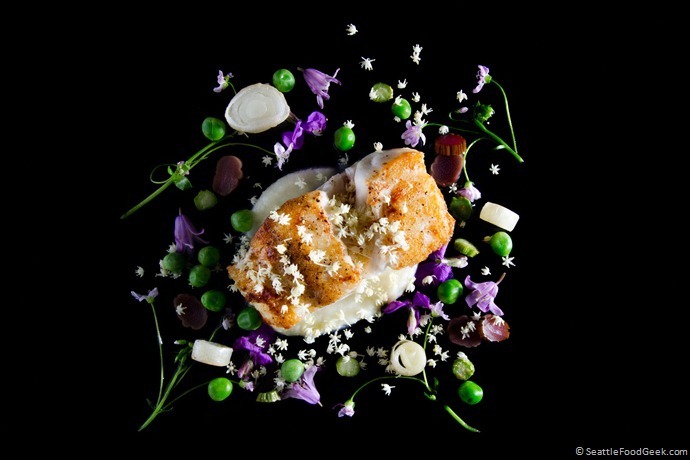 Ling cod with cauliflower puree, English peas, leeks and purple pickled asparagus. 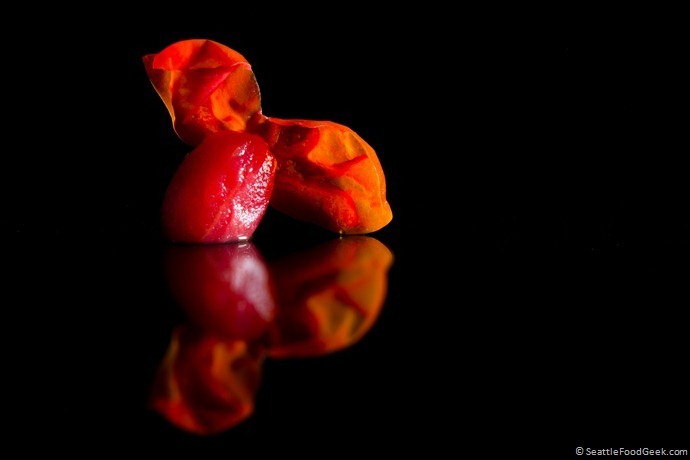 (Above and below) A grape tomato concasse. And just for the hell of it, a pickled shallot. A huge thanks to Eric for feeding me, and another big thanks to Ryan Matthew Smith for teaching me many of the techniques I used for this shoot. After seeing how well this shoot went, I’ve also decided to make myself available for hire. Contact scott@seattlefoodgeek.com if you’re interested in having your food photographed.